Loyal, hard-working employees are harassed, discriminated against and retaliated against every day in California and the U.S. If you feel you have been mistreated on the job, subjected to a hostile work environment or wrongfully terminated from your position, you have rights that must be protected. To receive measured advice, zealous advocacy and tireless dedication from an experienced lawyer when a workplace legal crisis arises, contact the Law Office of Jeffrey D. Fulton in Sacramento. During his more than 15 years of experience as an employment law attorney serving clients in central and northern California, Jeffey D. Fulton has won substantial judgments and settlements from some of the largest corporations in the world. Has your employer failed to provide compensation in an accurate, timely manner after overtime you worked? Has a supervisor or co-worker harassed you sexually or singled you out for discrimination on the basis of race, disability or any other reason? Has your report of illegal or unethical behavior in the workplace led to retaliation against you? For these and many other urgent situations, Jeffrey D. Fulton can help. Additionally, Mr. Fulton's personal injury practice safeguards the interests of clients who have been seriously injured, or lost loved ones, in motor vehicle accidents caused by the negligence of drunk and distracted drivers, and motorists who are uninsured or underinsured. His goal in every personal injury case he handles is to obtain financial compensation that reflects an injured client's lost income, medical bills, and the pain and suffering that victims encounter while recovering from injuries. Personal injury clients receive home and hospital room visits if needed, and a contingency fee basis for legal services. No attorney fee is owed unless your case is won. We understand the delicate, confidential nature of your employment law or personal injury claim. 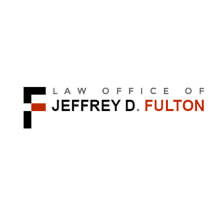 Please call or email the Law Office of Jeffrey D. Fulton to discuss your issues, in detail and in confidence, during an initial consultation.